Mission managers at NASA's Jet Propulsion Laboratory in Pasadena, California, this week lowered the orbit of the nearly 12 year old CloudSat satellite following the loss of one of its reaction wheels, which controls its orientation in orbit. While CloudSat's science mission will continue, the satellite will no longer fly as part of the Afternoon Constellation, or A-Train — six Earth-monitoring satellites that fly in a coordinated orbit to advance understanding of how the Earth functions as a system. An artistic rendition of the CloudSat satellite. CloudSat launched in 2006 to improve understanding of the role clouds play in our climate system and joined the A-Train about a month later. In April 2011, the spacecraft experienced a technical issue affecting the ability of the battery to provide enough current to power all spacecraft systems during the time in each orbit when the spacecraft is on the dark side of the planet and the spacecraft's solar panels are not illuminated. In response, spacecraft engineers at Ball Aerospace in Boulder, Colorado, developed a new operational mode for CloudSat that enabled it to continue science operations, but only during the part of each orbit when the spacecraft is in sunlight. In June 2017, one of CloudSat's reaction wheels displayed significant friction. It was subsequently determined that the wheel would no longer be usable, thus triggering preparations to exit the A-Train. On February 22, CloudSat successfully executed two thruster burns, placing the satellite in an orbit below the altitude of the A-Train. After telemetry has been analyzed, mission managers will determine if a third orbit trim burn is necessary. CloudSat will remain in this "safe-exit orbit" while the project studies orbit options for continuing science operations even farther below the A-Train. This artistic rendition shows the amount of time each spacecraft is separated along the group’s orbit track. Prior to the CloudSat removal, the A-Train consisted of four NASA missions and one Japanese mission: Aqua (launched in 2002); Aura (launched in 2004); the Cloud-Aerosol Lidar and Infrared Pathfinder Satellite Observations (CALIPSO) and CloudSat missions (launched together in 2006); and the Japanese satellite mission, the Global Change Observation Mission-Water (GCOM-W1) (launched in 2012). On November 16, 2011, PARASOL was lowered to 9.5 km under the A-Train and on December 18, 2013, PARASOL ceased operations. 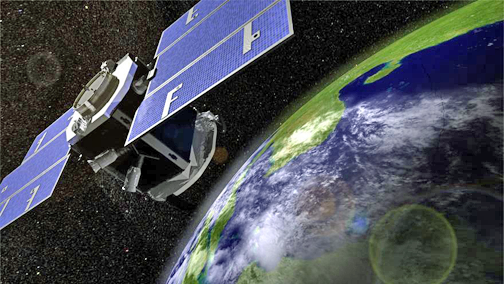 One more NASA mission—the second Orbiting Carbon Observatory (OCO-2)—will join the A-Train in 2014. The A-Train satellites rush along together like a train on a "track" 705 miles (438 kilometers) above Earth's surface, flying minutes, and sometimes seconds, behind one another. Together, the satellites and their more than 15 scientific instruments work as a united, powerful tool to examine many different aspects of our home planet. The A-Train has proven to be a successful integrated approach to observing Earth because it allows multiple instruments to observe the same location on Earth nearly simultaneously as they pass overhead. 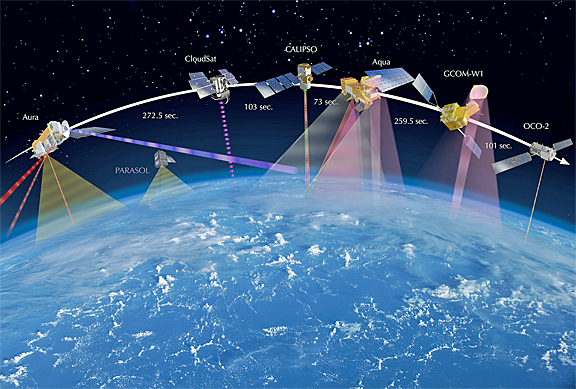 In addition to CloudSat (a partnership with the Canadian Space Agency and the U.S. Air Force), the other satellites currently in the A-Train include NASA's Aqua, Orbiting Carbon Observatory-2 and Aura spacecraft; the NASA/Centre National d'études Spatiales (CNES) Cloud-Aerosol Lidar and Infrared Pathfinder Satellite Observation (CALIPSO) spacecraft; and the Japan Aerospace Exploration Agency's Global Change Observation Mission - Water (GCOM-W1) satellite. With CloudSat now in an orbit below the A-Train, the satellite will occasionally pass beneath the constellation, enabling the mission to collect data in support of some of its pre-A-Train-exit data products.